Click on the photo and see all the photos of Apartamento Morros Epic 226. 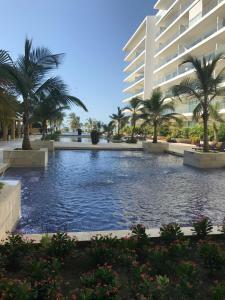 Apartamento Morros Epic 226 is situated in Cartagena de Indias and offers an outdoor swimming pool and a spa & wellness centre. Guests staying at this apartment have access to a fully equipped kitchen. Composed of 1 bedroom, this air-conditioned apartment features 2 bathrooms with a hot tub and a hair dryer. A flat-screen TV with satellite channels and a Blu-ray player are featured. Guests can make use of the sauna. A children's playground can be found at the apartment, along with a terrace. Steps of La Popa Mount is 7 km from Morros Epic 226. Rafael Núñez International Airport is 3.7 km away. Please note that by building policy, visitors are not allowed. Please inform Apartamento Morros Epic 226 in advance of your expected arrival time. You can use the Special Requests box when booking, or contact the property directly with the contact details provided in your confirmation. Guests are required to show a photo identification and credit card upon check-in. Please note that all Special Requests are subject to availability and additional charges may apply. Payment before arrival via bank transfer is required. The property will contact you after you book to provide instructions. A damage deposit of COP 300000 is required on arrival. This will be collected as a cash payment. You should be reimbursed on check-out. Your deposit will be refunded in full in cash, subject to an inspection of the property.